How many cups do you get from a bag of Baristador coffee? There are two common questions I get asked when people start considering making good coffee at home or in the office. The first is: How many cups of coffee do I get from a bag? The second is: How much does it cost to use gourmet quality coffee at home or at work? To answer this question conclusively, I employed an auditor to oversee me counting out espresso shot-sized scoops of coffee from one bag of Baristador Benchmark Blend B70 (video is below). The first question is hard to answer precisely because we all have different preferences, different scoops and different coffee equipment. For a long time I was wasting coffee by double-dosing my espresso machine (for extra oomph!) when all along I could have enjoyed the same ‘oomph’ with a single dose, given I was only producing a single shot. I did the experiment in a week when I had to ration my coffee (I was awaiting a fresh delivery) and discovered that a proper dose for a proper shot tastes no different to my double dose. Sigh. To think of all the spent coffee grounds that I dispatched to crema heaven untouched and untapped. What this means is my calculations today have been based on dosing for a single shot of espresso using the standard scoop that came with my espresso maker. I deliberately chose my consumer-level, domestic equipment because that is what most of us use at home and in the office. Here is the audited video count. To my pleasant surprise I discovered we get between 24 and 27 shots per bag. My count on camera was at the high end. My count during the last week using a bag with a shot recorder on it yieleded 24 cups with a little left over for part of a 25th. How much does it cost per cup? Now that we have some numbers to work with, the cost per cup, based on current pricing for Baristador, which is $14.50 per half pound bag, works out to 55c to 60c per cup. Let’s think about what that means. If you leave your work desk and travel to a cafe and back, paying anywhere from $3 to $6 for a coffee, making it yourself will save you time, put better quality coffee in your system (remember, most, not all, cafe owners run the cheapest beans they can find, often paying as little as 10c to 25c per cup), and save you from paying 600% extra for your coffee treat. Before the comments get filled with ‘but what about the community experience, someone else doing dishes, etc,’ I will concede that visiting a cafe has many splendid cultural rewards to offer and I will always enjoy the experience. 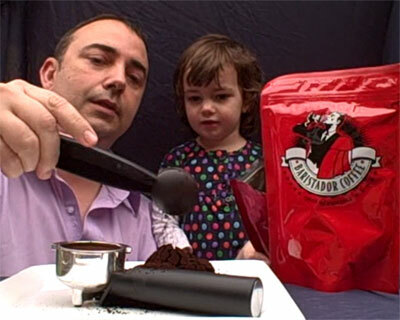 But I also believe it is handy to know that you can enjoy GREAT coffee at home for less than you ever imagined. Something to keep in mind if/when our higher prices take affect. How should I store my coffee beans, especially in summer?